Douglas K. (BS ’89) and Susan Vladimiroff (BS ’91) DeFord were among nearly 1,000 participants who converged on campus in late October for Parents Weekend, a three-day event that allows parents and students to experience BYU together in cultural, educational, and athletic activities. The Kennewick, Wash., couple made the trip a family affair by bringing their future Cougars with them to visit their daughter. The DeFords joined others for a Blue-au (sounds like luau) dinner with the Cougar Marching Band and Living Legends as well as a tailgate party with Vocal Point and other campus groups. Three hundred people participated in the 5k family run, and many attended class and church with their students. Parents Weekend, which is scheduled every fall after the football season is announced, will have a new event for 2008 called Classes Without Quizzes, in which parents will be offered a series of lectures that focus on current research at the university. 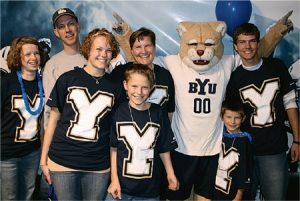 web: To learn about the 2008 weekend and to participate in the Parents Program, visit parents.byu.edu. The DeFord clan found a furry addition to their family when they traveled from Kennewick, Wash., to BYU for Parents Weekend in October.